What do you do if your horse has a loose shoe? If your horse's shoe is only a tiny bit loose, you can leave it on, binding it with self-adhesive or duct tape until the farrier can get there. If it's very loose, it needs to be removed. Not doing so means the horse can hurt itself by stepping on the shoe with another hoof, ripping the shoe off even more and leaving a sharp metal object full of sharp toe clips and nails flapping around under its hoof. Some horses may end up chipping and breaking the hoof wall if the shoe rips off accidentally. Loose shoes are best removed as soon as they are noticed. The first step is to remove the clinches. These are the ends of the nails that are bent over when the shoe was applied. You'll see the clinches as shiny squares on the outside wall of the hoof. With the rasp, file down the clinches until they're flush with the hoof wall. This is done by sliding the rasp back and forth over the top of each clinch until they're thin enough that they can be snipped or broken off easily. If you file from the top, you may not need to snip them. This can take some time, and you may find you'll work up a bit of a sweat doing it. After you've gotten rid of the clinches, you can start prying off the shoe. Pick up your horse's foot as you would for cleaning. Use the clippers to pry between the hoof wall and the heel of the shoe. Keep working the clippers further towards the toe of the shoe, lifting the shoe away from the hoof. Be careful not to put any leverage against the sole of the foot, as that might make your horse uncomfortable. To avoid leaving big nail holes that may cause chipping, try to pull the shoe straight off and not wiggle it side to side. You don't need a clinch cutter, and you might not have enough arm strength to use one properly, but if you have the tool and the strength, you can put it to good use. Place the edge of the cutter underneath the bottom-most edge of the clinch and use the hammer to tap and pry the end of the clinch up. With the clinches lifted away from the hoof wall, you'll be able to clip the ends of the clinches flush with the hoof. Be careful as you work. The clinches, as they stand away from the hoof, are quite sharp, and if the horse suddenly pulls its hoof away from you, could cause injury. Make sure all the nails are pulled out of the hoof too. You don’t want any to work their way into the hoof and cause damage. After you've removed the shoe, you may have to protect the hoof, especially if you're not removing the shoes and leaving them off to let your horse go barefoot. Protecting the hoof may help prevent chips and splits until the farrier can get there to replace the shoe. You can try wrapping the hoof thickly in duct tape or self-adhesive tape. If you plan to leave the shoes off, your horse may need to have its hooves trimmed to maintain the proper angles and prevent the hoof wall from splitting and chipping. It may not be possible to ride your horse if it has one missing shoe. 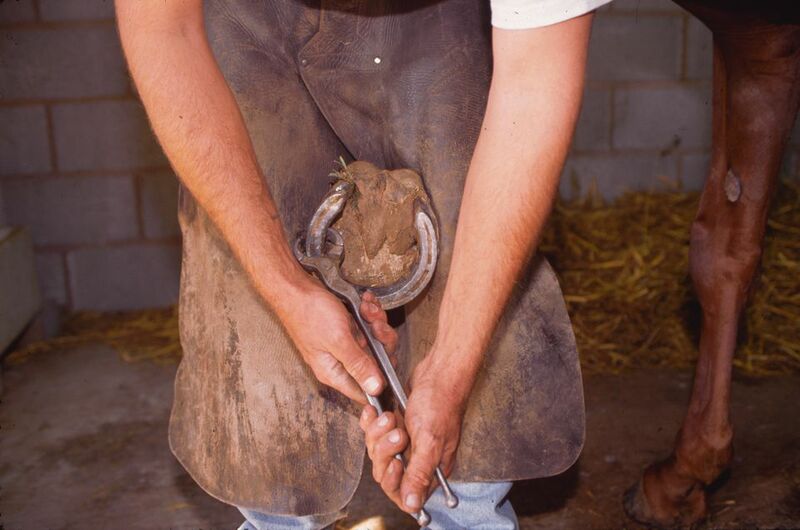 Ideally, your farrier will be able to replace the missing shoe quickly. If you must ride and the farrier is delayed, try to stay on soft surfaces like grass or sand. Riding a horse over grave or rocks can damage the hoof and possibly bruise the sole of the hoof if your horse isn't accustomed to going barefoot. Another alternative to protecting the hoof is to use a hoof boot. This can be removed after riding, or you may wish to leave it on to protect the hoof during turn-out and stall time as well. Just be sure to check that the hoof boot isn't chaffing, or flapping off and causing problems too. Should Your Horse Wear Shoes or Go Barefoot? Is It Time for Your Horse's Shoes to Be Reset?